National Precision Bearing, NPB, a leading supplier and distributor for airframe control bearings, spherical bearings, rod end bearings, miniature bearings and commercial industrial bearings announces the opening of a new ISO Class 6 cleanroom facility. This new facility more than doubles its current capacity for bearing relubrication services. The additional space and new equipment will make it possible to meet the increasing Aerospace, Defense, Medical, and Food Processing industry demand for specialty bearing relubrication. NPB relubricates new parts from inventory to meet special lubrication and fill requirements on standard parts, as well as customer owned inventory to help manufacturers and other distributors meet shelf life and on-hand inventory requirements. “We have more than doubled our capacity for relubrication to match ever increasing demand. With the support of our bearing suppliers, NPB fills a critical need in this market. Our new facility ensures our lead time on new orders cannot be beat”, notes Kent Ross, Mechatronics’ President. The cleaning and relubrication process at NPB is audited and certified by both customer and 3rd party inspectors. Among other standards, the cleanroom facility is certified to ISO 14644-1, 14644-2 and the entire process is included in National Precision Bearing’s AS9100 Rev. C certified quality system. National’s cleanroom is also factory certified for lubrication by major bearing manufacturers such as NHBB and RBC. In addition to quality, the cleanroom staff consists of National Precision’s most experienced supervisors and technicians, with over 150 years of combined relubrication experience. The NPB website has added a detailed relubrication service brochure that further explains the capabilities and lubricants provided by National. 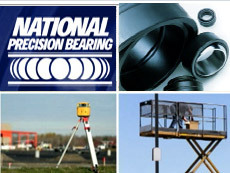 National Precision Bearing, in business since 1980, is a supplier and distributor of airframe control bearings, spherical bearings, rod end bearings, miniature ball bearings, and commercial industrial bearings to the aerospace, defense, medical and industrial markets. NPB is a well-known and respected supplier of a wide variety of bearings throughout the world. Our AS9100 Rev C and ISO 9001:2008 quality system meets or exceeds all the requirements of our major customers. We invite any of our customers to visit our facilities in Preston, Washington (near Seattle).